Article Text: Fine art courses have been cut and squeezed, demoted and destroyed in most parts of the country, usually on the grounds that art is impractical and out of place in our enterprise culture. Artists, quite rightly, disagree; but then they would, wouldn’t they? and a little hardship, the argument goes, never prevented Van Gogh’s life from becoming a great vehicle for Kirk Douglas. At the RCA, increased fees have yet to take full effect but shortened courses impose extra strains and it shows. However, Charles Hadcock, in the sculpture school at the RCA, impressed me with his transmutations. There’s the cast iron version of a lightweight container and less craggy maybe, there’s the cannon he has forged, upended to serve as a crucifix. A bell lies on its side, irreparably damaged, or so it appears until you realise that the whole object, pieced together from dozens of forged fragments, is false. The creation of heavyweight imperishables from stock, so to speak, involves adopting forms with built-in symbolism and recasting them as handmade ready-mades. Ah Duchamp, ah Beuys, and whither formalism? Here it seems the end product is something that looks remarkably like a precedent. 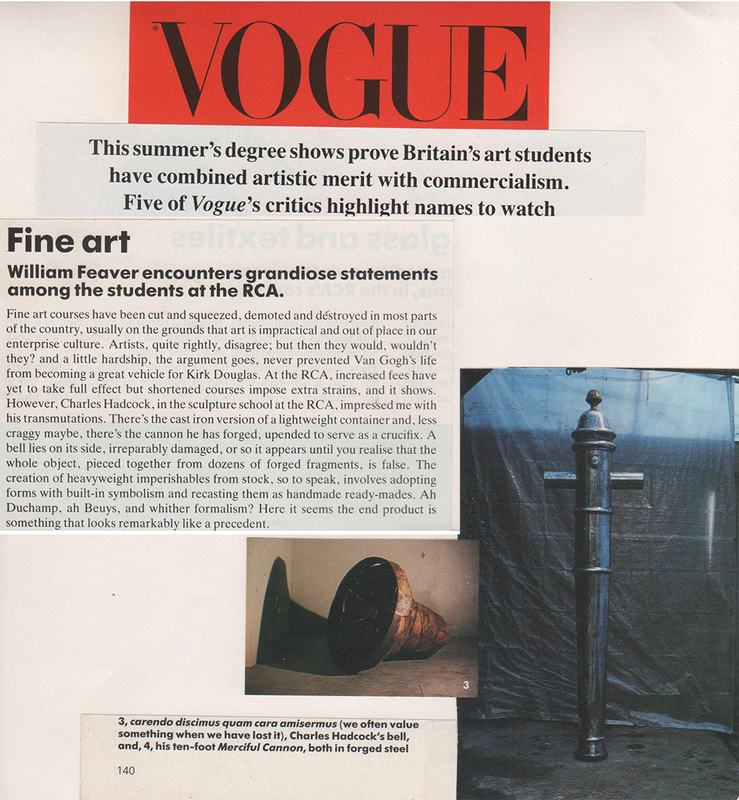 Article Text: In the meantime, the degree shows of the fine art schools of the Royal College of Art are already open to the public (Kensington Gore & Queen’s Gate SW7: until June 17), with the design schools’ shows to follow in early July. The general resurgence of abstract painting is clearly evident in much confident and accomplished work, with that of Zoe Benbow, Marco Cotton and the more restrained canvasses of Tom Benson outstanding. Of the sculpture, I was particularly taken by the simple metal bells and obelisks of Charles Hadcock and the symbolic figures of N.N.Rimzon, from Kerala in India. Article Text: Perhaps the most striking of the sculptors is Charles Hadcock, with a very professionally presented group of symbolic objects. His bigger pieces are not cheap, but then they probably cost a good deal to fabricate. the most evocative, perfect for a landscape garden designed by Capability Brown is a huge tongueless bell in forged steel. Mute, but quite likely to resonate in the imagination.